On February 18, 2015, ABC News reporter Michelle Charlesworth wrote an article titled “Decode your food cravings to find out what your body really needs.” Do you ever feel like you just cannot stop eating? Well, we all do. Increased appetite and cravings for some foods more than others is a super normal, natural thing, but if you are getting the same kind of cravings all the time, your body might be trying to tell you something. It is important for you to look beyond your cravings and figure out what they actually mean so you can then try some ways to combat or even prevent them. These are the most common food cravings and the alternatives that will help you overcome them. 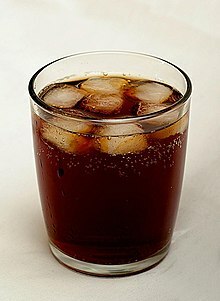 A glass of cola served with ice cubes. Photograph by Simon Cousins from High Wycombe, England. When it comes to soda, there are two things that might cause your cravings: caffeine and calcium deficiency. So, it might not be the actual soda that you are craving but the caffeine that is in it. If you use soda for an energy boost during the day, it would probably lead to a crash. If this is the case, you should probably switch the soda for a healthier alternative such as green tea, matcha, cold brew coffee etc. Carbonated drinks like soda have phosphoric acid, which causes calcium deficiency in the body. This is an easy fix because it is pretty easy to figure out whether you have calcium deficiency. All you have to do is a simple blood test. If it shows that you lack calcium you can start adding calcium rich foods to your diet right away. 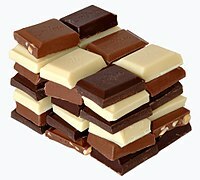 Chocolate most commonly comes in dark, milk, and white varieties. Photograph by nagualdesign. Chocolate is one of the most common cravings there is, and it might suggest magnesium deficiency or mild depression. A lot of people love chocolate, but there is a huge difference between enjoying chocolate and really needing it. Often times when your body is craving certain food it might just crave the nutrient that is in that food, and in this case that is magnesium. Chocolate is a great source of magnesium and the way to combat this craving is to start eating other foods that are high in magnesium, such as almonds, bananas, black beans etc. When it comes to your mood, studies have shown that chocolate increases the release of dopamine and serotonin, or the feel-good chemicals in your body. If you notice you are craving a lot of chocolate, think about what is going on in your life and try to get to the root of your problem instead of eating emotionally. Candy at a souq in Damascus, Syria. Photograph by Elisa Azzali. A study done between two groups of people showed that even being one hour short of sleep can drastically increase your cravings for sugary foods. The best way to replace sweets is with a healthy option like dried or fresh fruit. A serving of French fries. Photograph by Popo le Chien. If you are cravings chips, French fries or any other salty, fatty food that is probably not good for you, your body might lack some healthy fats. If you have these kinds of cravings and you feel the need to satisfy it right away you should always go with the healthier form of a salty food. In order to do this, first you have to figure out what exactly are you craving, the salt, the fat, or the crunchy? By figuring this out it will be much easier for you to decide between popcorn, salty almonds, avocados, or simply veggies with some sea salt on them. It is hard to control the intense desire to eat a specific food, we get it. When it comes to cravings in general, replacing the food you crave with a more nutritious option, or simply eating smaller portions with plenty of water will do the trick. Cooper, Michael. 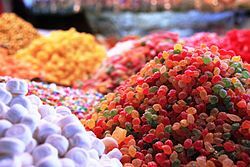 How To Reduce Your Sugar Cravings: Stop That Sugar Habit Controlling Your Life And Break Your Sugar Addiction Forever. CreateSpace Independent Publishing Platform, 2016. The featured image in this article, a photograph by Dezidor of a dish of assorted cookies, including sandwich cookies filled with jam, is licensed under the Creative Commons Attribution 3.0 Unported license.